Shirley Thompson is aiming to achieve two world records: she is hoping to become the oldest woman to row solo across an ocean and the first Irish woman to do so. Shirley has been training near Cannes and will start her challenge this coming November. Earlier this year Shirley gave a talk about her upcoming adventure during the Professional Women's Network summer party. I don't think anyone really appreciated the determination of this woman. Since then she has continued with her vigorous training in order to be as fit and capable as possible to fulfill the arduous voyage. Anna Fill of The Riviera Woman caught up with Shirley to learn more about her mission and to find out what inspired her to take on such a challenge? 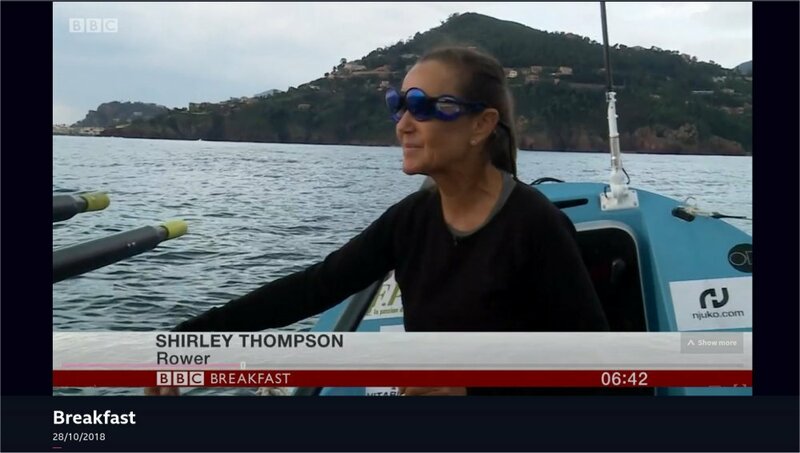 Considering that until recently Shirley had never taken part in any form of rowing and in fact couldn't swim... and doesn't even like to get her hair wet, this is one incredible woman! What inspired you to take up this challenge? Shirley: "I wanted to do something huge to celebrate my 60th birthday. Last year was a very difficult year for me with immense sadness and I needed a focus to help pick myself up. It was important for me to prove to myself that someone ordinary can do something extraordinary and that age is just a number. Women are so often considered as past their sell by date as they get older and this gives me a chance to show this is not the case. As I searched for a challenge I felt an ocean row was a very "green" one. Rowing an ocean also makes people think about our oceans, the plastics problem and looking after our planet - all these things are very important to me. I have a sponsor - Xeros Technology Group who have developed some ground breaking technology to address mircroplastics and also wastage of water, so I am thrilled to have them supporting me." What is the distance you will be rowing and how long do you anticipate it will take? Shirley: "It's about 3,000 miles, which is just over 4,828 kilometres, and it could take me 90+ days. How intense was your training? And can you now swim? How far did you have to go out of your comfort zone? Shirley: "It is all outside of my comfort zone! My training has included rowing, upper body strength, cardio, swimming, and I run daily but that doesn't really train me for a row. I am now more confident in the water, I am now swimming 75 lengths at a time in my pool. The swimming was to take away my fear factor in the water, but I hope I won't be in the water for long periods of time". How can we keep track of you on your journey? A girl's gotta eat... what provisions will you have? Shirley: "My diet will consist of dehydrated meals, plenty of snacks and I will take fresh food for the first week or so. I have had to build myself up and I have put on 6kg as I will loose a lot of weight on the row." What advice would you give to women who want to achieve something they may consider impossible? Shirley: "Nothing is impossible if you focus on it. Don't let society trick you into believing you are too old, too stupid, too incapable. We can ALL achieve anything we put our minds to." Shirley will be travelling to the Canaries on the 14th November and then she will prepare to leave the best weather window from the 20th from Puerto de Mogan in Gran Canaria to St Barts. One for the girls indeed!